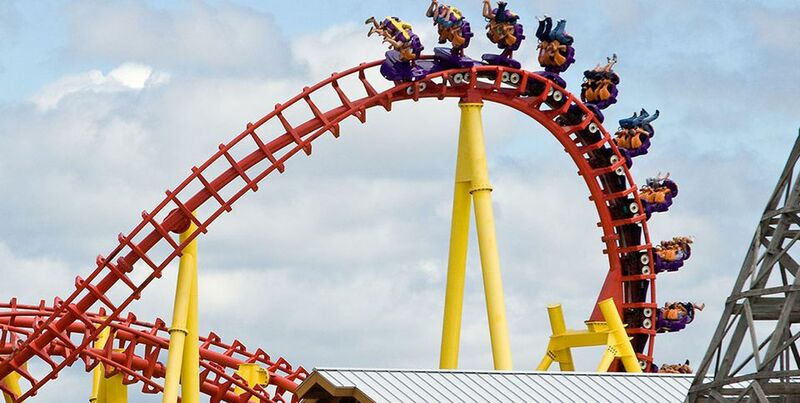 Michigan's Adventure is really the only major amusement park in the state. There are some smaller parks and family fun centers, however, that offer rides and other attractions. Let's take a look at Michigan’s parks. It's not an amusement park, but CJ Barrymore's Family Entertainment Center is a decent-sized facility with plenty of diversions including bumper boats, bowling, and a steel roller coaster with a loop (called, unimaginatively enough, "Loop Roller Coaster"). Crossroads Village and Huckleberry Railroad is a turn-of-the-century park with 30 recreated shops and historical interpreters in period costumes. Attractions include a carousel, steam train, paddlewheel boat, and a 1912 Ferris wheel. Neil's Dutch Village is a small park themed to 19th-century village life in the Netherlands. Attractions include a 1924 carousel and a swing ride. Funland Amusement Park is really more of a family entertainment center than an amusement park (despite its name). Attractions include go-karts, mini-golf, kiddie rides, a water slide, and an arcade. Located at the Lakeside Mall, this indoor family entertainment center has a few kiddie rides including a small coaster. There is also an arcade and a cafe with fast food. The indoor and outdoor family entertainment center includes go-karts, laser tag, batting cages, an arcade, and a 45-foot tall steel roller coaster. Tickets include admission to both the amusement park and the adjacent WildWater Adventure outdoor waterpark (when it is open). It includes a wave pool, water slides, a family raft ride, a funnel ride, and areas for young children. Stagecoach Stop USA is a wild west-themed small park with a train ride, panning for gold, and an antiques museum. Deer Acres Fun Park was a small attraction for very young children themed to fairy tales. Rides included antique cars, a safari ride, a merry-go-round, and a Ferris wheel. At the time this was written, the park was under renovation and may or may not reopen. If you're able to make the drive out to neighboring states, here are a few options that are close by. Let's acknowledge a few of the parks that have since closed in Michigan. Take Edgewater Park in Detroit, for example. It opened in 1927 and offered coasters such as the wooden Big Beast and the amusement park staple, Wild Mouse. Like many smaller parks from a bygone era, it couldn't compete and closed its gates in 1981. Other defunct Michigan parks include Silver Beach Amusement Park in Saint Joseph, which operated from 1891 to 1971, Wenona Beach in Bay City, which entertained visitors from 1887 until 1964, and Walled Lake Park in Walled Lake, which lasted fromn 1919 to 1968.